GALION — You are a deployed service member. You have been up all night or roasted all day in service to your country. The holidays are here and you are tired, lonely and depressed. Then you get passed a package postmarked Galion, Ohio. You open it and your whole world changes. Because someone from back home remembered you. 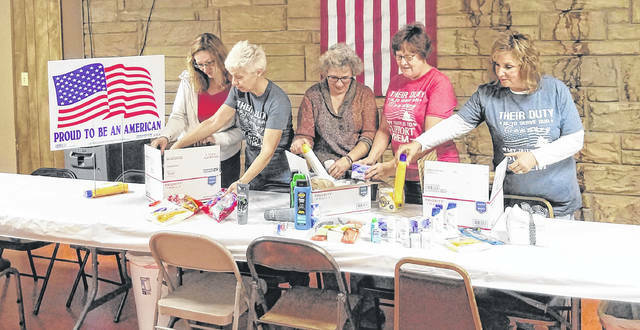 Support Galion Troops is a local organization committed to sending monthly “care packages” to deployed service personnel from Galion and the surrounding area, including the Northmor, Colonel Crawford and Crestline areas. The organization was formed in 2011 and is composed primarily of women who are mothers of current or former military members. The group has established their new permanent “Headquarters” at Galion American Legion Scarbrough Post 243, one block south of the square. The organization relies solely on donations and fundraisers the group conducts to obtain the items to send and to fund the postage for the packages. As an example, the pack out for the Christmas boxes is Nov. 26 when the group will assemble more than 70 packages and incur postage of well over $1,200 to take care of our deployed area service members during the Christmas season. Anyone wishing to help care for our area’s deployed personnel may contact Gloria Smith at 419-468-4321, email Galiontroops@gmail.com, or contact the Galion American Legion 419-468-1208. Cash donations are used for postage and to purchase needed items that are not donated. Donations of the authorized items are always welcomed. Items allowed include non-melting candy, beef jerky sticks, cans or packets of meat and fish (no pork please), dried fruit, protein or granola bars, batteries, chap stick, foot/body powder, gloves, band aids, gum, crew socks, drink mixes, pens, writing paper, envelopes, q tips, wash cloths, sunblock, puzzle books, hand warmers and many other non-perishable items. Items that cannot be sent include pork and pork products, alcoholic beverages, items that melt, glass, pressurized items, or religious material possibly offensive to the local culture.